Carry and protect 1-2 pro DSLRs, including one with up to 24-70mm f/2.8 lens attached, with this black ProTactic 350 AW Camera and Laptop Backpack from Lowepro. The bag also accommodates 6 extra lenses or flash units, as well as a tripod and a 13" laptop. Four access points at the top, sides, and back help you quickly organize your gear or grab it to get a shot. Depending on size, some gear configurations will be easier to access than others. For instance, a DSLR with grip and telephoto will be accessed more easily by unzipping the main compartment. Create customized configurations with the SlipLock-compatible strap system and MaxFit interior dividers. The ProTactic 350 provides targeted comfort and support with its ActivZone System harness, which includes a waistbelt that's easily removable for storage and travel. Additionally, the bag offers a built-in all-weather cover to safeguard your gear against the elements. Five supplied modular accessories, including a water bottle pouch, accessory case, tripod cup, and two cinch straps, are all SlipLock-compatible. The ProTactic is crafted from both 210D and 1680D nylon, as well as nylon webbing and 900D polyester. Accommodates 1-2 pro DSLRs, including one with up to 24-70mm f/2.8 lens attached, plus 6 extra lenses or flash units, a tripod, and a 13" laptop. Four access points at the top, sides, and back help you quickly organize your gear or grab it to get a shot. Depending on size, some gear configurations will be easier to access than others. For instance, a DSLR with grip and telephoto will be accessed more easily by unzipping the main compartment. MaxFit System of padded, adjustable interior dividers for snug, secure fit and easy customization. SlipLock-compatible strap system and modular accessories, including water bottle pouch, accessory case, tripod cup, and two cinch straps. Keep accessories neat, organized and easy to access with multiple interior and exterior pockets. Quickly grab gear via 2 side-access pockets. CradleFit laptop pocket suspends and protects your computer. ActivZone System harness delivers targeted support at shoulder blades, lumbar area, and waist for comfort on the move. Includes a waistbelt that's easily removable for storage and travel. Built-in all-weather cover to safeguard your gear against the elements. Made from both 210D and 1680D nylon, as well as nylon webbing and 900D polyester. Laptop Compartment Screen Size 13.0"
Box Dimensions (LxWxH) 18.4 x 12.7 x 9.4"
ProTactic 350 AW Camera and Laptop Backpack (Black) is rated 4.4 out of 5 by 128. Rated 4 out of 5 by Scott the Nomad from Great pack for longer hikes I use this backpack for my longer hiking trips. It's great that it fits all my gear and isn't too heavy. The chest and waist straps help to displace the weight of the pack and help with the overall comfort. The construction of the pack also helps keep my back straight so the weight of the gear doesn't put unnecessary strain on my back. One thing I dislike about the pack is how small the exterior pockets are, I can only fit a cell phone or keys in them. However, this is alleviated by the attachment bags that can be hooked anywhere on the pack, a really great feature. Overall, a great pack for hiking that holds all my gear and doesn't weigh too much. A great purchase so far. Rated 2 out of 5 by fernando v. from Bought to fit 2 DSLRs I was looking for the lightest backpack that could fit DSLRs with easy access for my Canon 6D and 5D mkii with prime lenses attached. Based on the specs, this was the perfect bag. But when I received the bag, I found the side access openings to be too small for easy access. With the 6D or 5D mkii (with 50L, 24L or 35L attached) the side opening was too small. It was difficult to pull the camera out with ease. The size of the top opening is just OK. The camera body with lens attached was pretty tight. Build quality of the bag is excellent. Nice features. The openings are just too small for easy access in my case. If you have smaller camera bodies, this would be perfect you. Rated 5 out of 5 by Jim from I've found the right camera backpack!!!! I own both the Protactic 350 & 450 AW and these are the best camera bags I've owned yet! I use the 450 for my full travel/landscape photography kit w/2 bodies with lens attached, several other lenses, and several accessories. The 350 I carry as a day bag with 1 body, a couple lenses, and some odds and ends depending on what I'm doing and where I'm going. The 450 holds a ton of gear and can get a bit heavy but is reasonably comfortable with a lot of weight using the waist/hip strap, the 350 is perfect for day hikes and can be easily carried around full of gear all day. Both bags are tough and built to last! As far as I'm concerned, my camera bag search is over for a long time finally! Rated 1 out of 5 by Anonymous from Cool looking bag, doesn't fit gear well I bought this bag for the style and the ability of what it said it could fit. I rearranged the tabs around and seemingly tried to get everything to fit. I have a canon 70d dslr with two lens and two gopros and a handful of mounts plus my 13 inch laptop. I thought I had everything fitting in it nicely but when I went to put my laptop inside. it wouldn't fit. I also didn't like the two side pockets at the bottom. For me they didn't work. Trying to piece everything to fit right the side pockets were to big for the taps inside to make it work. The top hardshell pocket is way to snug to pull out your camera. you have to sort of yank it out. Same with the side pockets. The bag really isn't as cool as it looks. Rated 3 out of 5 by Jake from Good but not Great Bought this because it had dual access side pockets and there are very few bags with that feature, this one also including a top compartment as well made it even more appealing. The materials are top notch and the bag itself is bomb proof with great zippers and quick access. Now for the downside, the advertising states this pack will hold 1-2 PRO DSLR's which just isn't true. A D810 will not fit in the side acess points no matter how hard you try to get it to, it will however fit in the top portion but with some struggle. Even a D7100 is a tight fit going in and out of the side compartments. So the quickness is automatically gone because instead of seinging your gear out to snag a shot you're left struggling to get you hand in and pry it out. Lowepro should state this bag is for smaller systems and the larger 450 variant is meant for pro cameras. Other than that this was my only real complaint about this bag. Rated 3 out of 5 by Anonymous from Good Quality build But... The pro-tactic 350, is a lot tighter for holding equipment than the online images show and the camera check indicates on the Lowpro web page. My camera equipment did fit in, but was so tight is was time consuming to replace and remove component. I would the accessible top and side compartments that allow access to cameras directly were too tight for a 1dx, but just about right for a 5Ds. This is that ultimately led to only a 3 star rating. I exchanged to the 450 version of this bag and everything fit great, feels great and very functional. Does it fit an Acer 12 but with a case that is: 11,8 x 8,5 x 1,3 ? Remember, the size in a computer's name is the diagonal of the screen. The Acer 12 is 11.5 x 0.4 x 7.9 / 29.2 x 1.0 x 20.1 cm. The Lowepro ProTactic 350 AW Camera and Laptop Backpack (Black) B&amp;H # LOPTA350AW can take up to a 13 diagonal computer. Can it fit a small size Edelkrone SliderPLUS? The Lowepro ProTactic 350 is 10.6 x 6.3 x 15.2 / 27 x 16 x 38.5 cm. The edelkrone SliderPLUS Small (13.2 ) is 2.5 x 3.6 x 13.2 (6.4 x 9.2 x 33.6 cm). With 2 /50mm to spare, you are good to go. Is this backpack deep enough for a Nikon D610 with the MB-D14 battery grip attached? I have a Chanon Mark IV with battery grub and it fits just fine. A little snug. But this pack is pretty great. What are the 5 modular accessories that are supplied? Five supplied modular accessories include: a water bottle pouch, accessory case, tripod cup, and two cinch straps. what is hip belt waist size? Fortunately, we have a display copy in the store. The waist belt measures 55 , end to end. Is GITZO Mountaineer 2542 fits underneath of outside this backpack? No, the tripod would not connect to the bottom of the backpack. The Gitzo GT2542 Mountaineer Series 2 Carbon Fiber Tripod may be used with the tripod cup and two cinch straps on the right-hand side of the backpack to carry the tripod on the backpack. 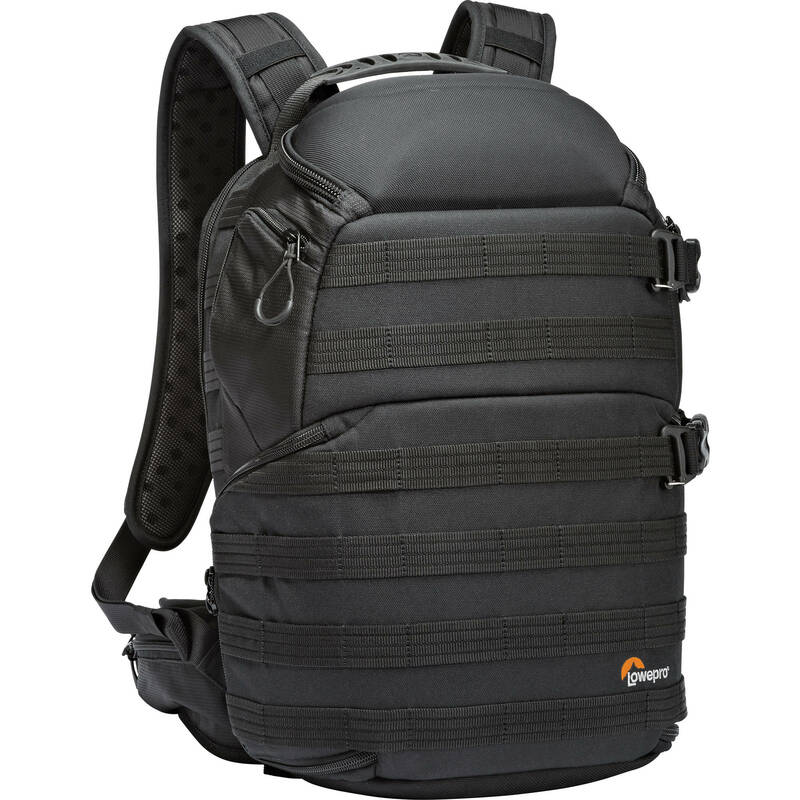 There are no attachment points on the bottom of the Lowepro ProTactic 350 AW Backpack. Can the LowePro Deluxe technical belt be used with this pack, i.e. substituted for the one that comes with it? Will this fit a mirrorless camera, 1-2 extra lenses and the Mavic 2 flymore combo/bag? I don't have the Mavic, but looking at the size given for it, I would say it's possible, but this would be VERY tight fit for that and a camera body and 2 extra lenses. This bag is very much 'form fitting' for the camera to ride at the top with one lens attached, other lenses accessible from sides. I would suggest a size larger just to be safe. That said, I LOVE this bag for travel, it's just the right size for camera, 3-4 smallish extra lenses, accessories. Super durable and protects my gear wonderfully. But for carrying &quot;more stuff&quot; I use a bigger bag.